SKU: ARS-350-1031 Categories: USAF INSIGNIA, AIR REFUELING, SQUADRONS Tags: 22nd Air Refueling Wing, 22nd Operations Group, KC-135 Stratotanker., KS, McConnell AFB, USAF 350th Air Refueling Squadron Desert Patch, worldwide aerial refueling. Lineage. Constituted 350 Bombardment Squadron (Heavy) on 28 Jan 1942. Activated on 1 Jun 1942. Redesignated 350 Bombardment Squadron, Heavy, on 20 Aug 1943. Inactivated on 15 Dec 1945. Redesignated 350 Bombardment Squadron, Very Heavy, on 9 Jul 1947. Activated in the Reserve on 16 Jul 1947. Inactivated on 27 Jun 1949. Redesignated 350 Bombardment Squadron, Medium, on 1 Aug 1955. Activated on 1 Jan 1956. Redesignated 350 Strategic Reconnaissance Squadron on 25 Jun 1966. Inactivated on 1 Jul 1976. 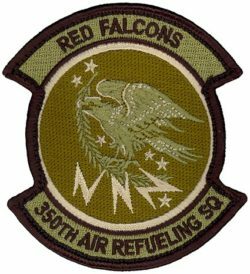 Redesignated 350 Air Refueling Squadron, Heavy, on 19 Jan 1982. Activated on 28 Jan 1982. Redesignated 350 Air Refueling Squadron on 1 Sep 1991. Assignments. 100 Bombardment Group, 1 Jun 1942-15 Dec 1945. 100 Bombardment Group, 16 Jul 1947-27 Jun 1949. 100 Bombardment (later, 100 Strategic Reconnaissance) Wing, 1 Jan 1956-1 Jul 1976 (attached to Sixteenth Air Force, 4 Mar-4 Apr 1958). 100 Air Refueling Wing, 28 Jan 1982; 9 Strategic Reconnaissance Wing, 15 Mar 1983; 9 Operations Group, 1 Sep 1991; 43 Operations Group, 1 Oct 1993; 22 Operations Group, 1 Jul 1994-. Stations. Orlando AB, FL, 1 Jun 1942; Barksdale Field, LA, 18 Jun 1942; Pendleton Field, OR, 26 Jun 1942; Gowen Field, ID, 28 Aug 1942; Walla Walla, WA, 31 Oct 1942; Wendover Field, UT, 30 Nov 1942; Sioux City AAB, IA, 6 Jan 1943; Kearney AAFld, NE, 4 Feb-1 May 1943; Thorpe Abbots, England, 2 Jun 1943-9 Dec 1945; Camp Kilmer, NJ, 14-15 Dec 1945. Columbia AAB, SC, 16 Jul 1947-27 Jun 1949. Portsmouth (later, Pease) AFB, NH, 1 Jan 1956 (deployed at Brize Norton RAF Stn, England, 4 Jan-4 Mar 1958, and at Torrejon AB, Spain, 4 Mar-4 Apr 1958). Davis-Monthan AFB, AZ, 25 Jun 1966-1 Jul 1976. Beale AFB, CA, 25 Jan 1982; McConnell AFB, KS, 1 Jul 1994-. Aircraft. B-17, 1942-1945. AT-6, AT-7, and AT-11, 1947-1949. B-47, 1956-1966; DC-130, 1966-1976; CH-3, 1966-1976; AQM-34 (drone), 1966-1976. KC-135, 1982-. Operations. Combat in European Theater of Operations (ETO), 25 Jun 1943-20 Apr 1945. Global bombardment training, Apr 1956-Feb 1966. Operated AQM-34 strategic reconnaissance drones launched from DC-130 aircraft and recovered by CH-3 helicopters, 1966-1976. Provided refueling support for SR-71 aircraft, 1983-1990. Provided cargo support and intratheater refueling during combat in Southwest Asia, Aug 1990-Mar 1991. Furnished air refueling support for long-range operations since 1991. Trained and supported Singapore Air Force Peace Guardian detachment based at McConnell AFB, KS, 1999-2000. Campaign Streamers. World War II: Air Offensive, Europe; Normandy; Northern France; Rhineland; Ardennes-Alsace; Central Europe; Air Combat, EAME Theater. Southwest Asia: Defense of Saudi Arabia; Liberation and Defense of Kuwait. Decorations. Distinguished Unit Citations: Germany, 17 Aug 1943; Berlin, Germany, 4, 6, 8 Mar 1944. Air Force Outstanding Unit Award with Combat “V” Device: 1 Jul 1972-30 Jun 1973. Air Force Outstanding Unit Awards: 1 Jul 1968-30 Jun 1970; 1 Jul 1983-30 Jun 1984; 1 Jul 1985-30 Jun 1986; 1 Jul 1986-30 Jun 1987; 1 Jul 1989-30 Jun 1990; 1 Sep 1991-30 Jun 1993; 1 Jul-1 Oct 1993; 1 Jun 1994-31 May 1996; 1 Aug 1999-31 Jul 2000; 1 Aug 2000-31 Jul 2001; 1 Aug 2002-31 Jul 2004; 1 Aug 2004-31 Jul 2005; 1 Aug 2005-31 Jul 2006. French Croix de Guerre with Palm: 25 Jun-31 Dec 1944. Emblem. Approved on 17 Apr 1959; modified on 9 Mar 1995.